Never wasting a chance to stir up confusion, Hugh and I made a trip to Homa to arrange some labor swapping for a chance to do drive a different sort of car. Hugh had talked our friend Donnie and his brother Jeff, into doing engine swaps on two of Rory White’s formula 500 cars. I was quite familiar with this type of car as I had been around when they were first invented. They had started out as Formula 440. The reason they were called that was that they used a 440 cc liquid cooled, two cycle snow mobile engine with a centrifugal clutch, no transmission. They had no suspension, sort of like a giant go cart. With driver they had to weight a minimum of seven hundred and fifty pounds. But here’s the kicker, those little engines put out about seventy five horse power. That provides a weight to power ratio of about ten to one. Fantastic. Better than a ‘Vette. The ratio on a Vee is about eighteen to one. Later the manufacturer of that engine moved up to a bigger model and stopped production on the 440. As a result the class just moved up with them and is now called Formula 500. Rory had two of them. One was set up for Autocross and utilized a chain drive for faster acceleration from slower speeds. The other was set up for road racing and used a belt drive, since it was always at higher speed to start with and didn’t require the low speed torque. The engine in the road racing car was used up. It needed to be replaced or rebuilt. 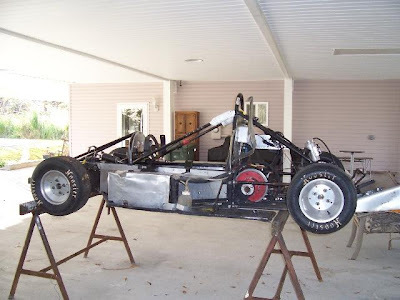 The object of the exercise was to pull the engines from both cars, put the autocross engine in the road racing car and then, eventually, replace the engine in the a’cross car. Dr. Rory, who stays very busy with his practice and his other activities, just didn’t have the time to do it himself. He’d offered some “seat time” for getting it done. We went over to Rory’s shop. Both cars were stored in a container he keeps beside the shop. The cars are small and light. It didn’t take long before we had the first one out, on the trailer and headed back to Donnie’s. Two days later the car had had the engine pulled, the whole car had been degreased, pressure washed and had most of it’s nuts and bolts tightened up It had never been cleaner. Now they were ready to go after the second car.